Gary W. Hart came to national attention as a political campaign organizer, a two-term U.S. senator, and a presidential candidate. Gary Warren Hart was born on November 28, 1936, in Ottawa, Kansas, an agricultural community where his father farmed and sold farm equipment. The family moved to Colorado several years later. At college, he shortened his family name from Hartpence to Hart. He married the former Oletha (Lee) Ludwig in 1958. They had two children, Andrea (born in 1964) and John (born in 1966). Throughout his youth, Hart had considered the ministry as his life's vocation. He entered Bethany Nazarene College in Oklahoma and earned his B.A. degree in 1958. After graduation, he entered Yale Divinity School, where he planned an academic program in philosophy and religion. At Yale he discovered there were alternatives of service, and his career goals changed with his entry into the world of politics. Though his interest in a religious career changed, he stayed at Yale to receive a B.D. degree in 1961. Hart's new objective was to study law. He entered Yale's School of Law and earned his LL.B. degree in 1964. Hart began his career in Washington, D.C., working as an attorney in the Department of Justice. Two years later he became a special assistant to Secretary of the Interior Stewart Udall and specialized in oil shale issues in the Western states. He left government service and moved to Denver, Colorado, in 1967. There he practiced law and taught natural resources law at the University of Colorado School of Law in Boulder. Hart got his first experience in politics when he was a student volunteer in the 1960 presidential campaign of Senator John F. Kennedy. He volunteered again in the 1968 presidential primaries to work for Senator Robert F. Kennedy. Senator George S. McGovern persuaded Hart to coordinate his 1972 presidential bid. Hart agreed to help McGovern by organizing a campaign structure in the Western states. He soon undertook the task of national campaign director. He helped create a coalition of liberals and anti-Vietnam War believers to support McGovern. Hart's major achievement in that campaign was to create a grassroots organization—an army of volunteers—which relied heavily on door-to-door visits, neighborhood canvassing, and raising small, individual campaign donations. McGovern lost the election in a Richard Nixon landslide, winning only about 38 percent of the popular vote nationwide and obtaining electoral votes only in Massachusetts and the District of Columbia. The time had arrived, Hart felt, to run for office himself. He entered the 1974 Senate race in Colorado. He began his campaign as an underdog against the incumbent two-term Republican senator Peter H. Dominick. Hart ran as a new voice in politics and relied on his grassroots network of supporters. He won with over 57 percent of the vote statewide. In 1980 Hart ran for a second term. He barely won the office with a majority of less than 20, 000 votes out of nearly 1.2 million cast. In the Senate Hart liked to think, ask questions, shape ideas about long range strategies, and do his homework. He was considered an intellectual force and a loner rather than a persuader or wheeler-dealer. He served on the Environment and Public Works Committee, the Armed Services Committee, and the Budget Committee. On environmental policy, Hart considered himself a conservationist rather than an environmentalist. He wanted natural resources to be guarded by the government, but believed that they should be developed. He supported the need for nuclear energy, but pushed for safety precautions and solutions to the problem of nuclear waste disposal. Hart also promoted the development of solar energy. America's military policy became a special interest of Hart's. The senator wanted to redirect the country's defense strategy. Hart's emphasis was to shift conventional warfare to maneuver warfare. In naval operations, for example, Hart wanted a shift from huge aircraft carriers to a more mobile fleet of smaller, less costly ships. He supported a nuclear weapons freeze, nuclear test bans, and arms limitation. Senator Hart founded the bipartisan Congressional Military Reform Caucus to develop reforms in military strategy. His interest in America's military defense can best be illustrated by a dramatic personal move. At the age of 44, never having served in the armed forces, he joined the Naval Reserve. Hart sought the presidential nomination in the 1984 primaries. Again, he seemed the underdog, for 1983 polls showed him to be near the rear of a group of prospective candidates. Underfinanced, he relied on his traditional grassroot volunteers strategy. The 1984 campaign slogan was "New Ideas, New Generation." Hart's new ideas were to avoid traditional means of treating problems. Instead of a choice between conservatism and liberalism, he wanted to create a third option and focused on trying to convince the public that the real choice is between the past and the future. He attempted to reinforce the Democratic Party's image of social concerns, while repudiating its emphasis on big government and governmental regulation of business. Hart spoke for individual rights and a respect for free enterprise and economic productivity. He claimed independence from party leaders and special interests. His appeals were directed to the emerging group of young, upwardly mobile professionals ("yumpies" or "yuppies, " as the terms were popularized at the time)—a new generation of educated men and women born after World War II. Almost overnight his long-shot candidacy vaulted from the back of an eight-candidate race to the forefront after unexpected victories in the New Hampshire primary and the Iowa party caucuses. Riding a wave of momentum, he captured party delegates in New England and other states during February and March 1984. The fast pace of success could not keep up with the need for organization in many states. His momentum was lost to a well-organized campaign and support from labor and other interest groups for former Vice-President Walter F. Mondale. Hart floundered in the South and found little electoral support in the urban, industrialized areas. At the Democratic nominating convention, Hart lost to Mondale by 1, 200.5 delegate votes to 2, 191 votes. In 1986 Hart did not seek a third term in the Senate. He continued to advance his issues and causes, and in 1987 he began another campaign for the presidency. Hart's campaign was hampered by rumors of his womanizing, so Hart openly challenged the press to follow him. Shortly thereafter, reporters from the Miami Herald "caught" Hart with 29-year-old model/actress Donna Rice. It was revealed that the pair had vactioned together, and Hart withdrew from the race. 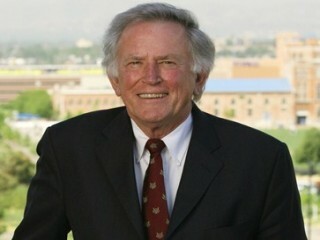 The former senator resumed his law practice and hosted a radio talk show in his home state of Colorado. Many of his political supporters urged him to "get back into politics, " by running for his former senatorial seat. Hart has written several books which explain his activities and issue focus. Right From the Start: A Chronicle of the McGovern Campaign (1973) is a personalized account of the operations, decisions, and strategies of the 1972 presidential race. The Good Fight: The Education of an American Reformer (1993), detailed his political education and provided insight into his reform philosophy. For additional biographical detail on ex-Senator Gary Hart, consult Biographical Directory of the American Congress 1774-1996; and U.S. News and World Report, April 10, 1995, which carried a brief summary of Hart's political involvement. View the full website biography of Gary Hart.